Black Steel is an Australian five piece band playing melodic power metal. The band cites typical influences for a power metal band such as Accept, Judas Priest, and Iron Maiden. The band is able to put together the double bass powered metal anthem, the mid paced rocker while keeping a strong sense of melody and big choruses. After forming in 2000, the band recorded an EP called Battle Call. Destructor is their debut full length album. For a debut album from an underground band, the production is surprisingly good. Of course, we're not comparing them to the Edguy or Stratovarius releases, but each instrument is adjusted to the right level, and the drumming is crisp and clear. The album contains a nice balance of powerful, double bass backed tunes, a very good epic, Hell's Gates, mid paced tunes, and a ballad. The rhythm section is particularly strong as bassist Dave Harrison plays with authority that would make Steve Harris proud. Combined with the tight and efficient Damien Petrilli on drums, the two provide a very solid backbone to the band's sound. Not to be overshadowed by bassist Dave Harrison, Jamie Page and Andrew Di Stefano form a very good team on guitars as far as riffing goes. The album is full of bold, driving riffs and Maiden like dual leads. I would have liked to hear the two dazzle us with some more soloing though: the album is a little timid in this area. The common thread through each of the songs is a strong riff and anthemic chorus line. The songwriting is very strong, as there is no filler material and the album is quite consistent. The vocal department is where I think the band could most improve. Lead vocalist Matt Williams seems somewhat shy behind the mic at times. He does well in the lower ranges, but doesn't go balls out for the high notes. While he sings with gusto in the low range, his delivery is somewhat thin in the higher range. He seems more comfortable during the chorus lines with his band mates backing him up though. As time passes, I'm sure he will develop more confidence behind the mic and add a lot more color to the songs. All in all, this is an extremely promising debut from the land down under. 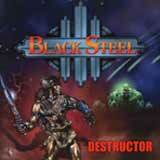 Strong songwriting and production aren't terribly common for a debut, but Black Steel has both. Disciples of the heavy riff will want to check these guys out.